AFRO-EUROPE: Black in Nazi Germany - Esi Edugyan about her novel "Half-Blood Blues"
Black in Nazi Germany - Esi Edugyan about her novel "Half-Blood Blues"
Canadian author Esi Edugyan talks about her new novel Half-Blood Blues. 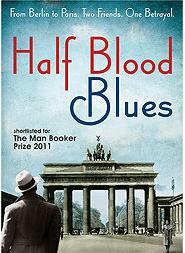 A story about the black experience in Nazi Germany which took the Scotiabank Giller Prize yesterday. Fifty years later, his friend and fellow musician, Sid, must relive that unforgettable time, revealing the friendships, love affairs and treacheries that sealed Hiero’s fate. From the smoky bars of pre-war Berlin to the salons of Paris – where the legendary Louis Armstrong makes an appearance – Sid, with his distinctive and rhythmic German-American slang, leads the reader through a fascinating world alive with passion, music and the spirit of resistance. In an interview with The Mark the Canadian writer of Ghanian descent talks about her book and her experience in Germany and France. THE MARK: The book offers a deep commentary on conceptions of race. What kind of reflections or questions were you hoping to leave the reader with at the end? EDUGYAN: One of the fascinating things that emerged from my research was how differently people of the same race could be treated under the Third Reich. In the case of blacks, for example, African diplomats were left mostly unmolested, as were certain other foreigners. Afro-Germans seemed to receive the worst treatment: A plan was actually put in place to sterilize some of the children. And then, of course, there was the treatment of the Jews. I wanted to show the complexity of all these realities. It’s a novel, of course, and not a work of non-fiction, and so whatever the reader is left with should, I hope, arise out of the material, out of empathy with the characters, rather than from some political position. THE MARK: The book is situated mostly in Berlin and Paris. How do you write so intimately about cities so far from where your life is based? Are the gaps filled in with imagination, or with research? EDUGYAN: Between the publication of my first novel and this one, I lived in, and traveled widely throughout, Europe. Most of my time was spent in Germany – first a year in the south, in Stuttgart, and, later on, two months in a little northern town. As a black woman living in what is, admittedly, a homogenous society (compared to Canada), I began to wonder about the experience of black people who had lived in Germany in the past, specifically during the Third Reich. Intimacy is a curious thing, and the imagination has a lot to do with it. It’s possible to inhabit distant cities through the writing alone, though the extensive research required for a historical novel necessarily provides boundaries. I’m reminded of a recent visit to Paris, where I met a friend who seemed to know all things Parisian and navigated us through the city’s streets effortlessly. I was surprised, as I didn’t think he had been in the city long. It turns out that he’d learned most of what he knew through reading Balzac’s novels. Esi Edugyan does a reading from her book, Half Blood Blues. Also read a very good review of the book here.